George Cyr was born in Montgeron (Seine et Oise), in France, in June 1881. The beginnings of his artistic career, circa 1910, were confirmed as a result of advice from the artist Jean-Baptiste-Armand Guillaumin, friend of Gauguin, Pissaro and Monet. His first one-man show was held at the Galerie Moderne in Rouen (* see note 1 below) in 1922. By 1924, Cyr was exhibiting at the Salon des Independants in Paris and in that year held one-man shows in le Havre, Rouen and Paris. In 1934, having suffered setbacks in his personal life he accepted the opportunity to move to Beirut, where he was assisted in finding accommodation by the French Embassy. After his first few weeks in Beirut, he fell in love with the city and decided to settle in Ain El Mraisse. Cyr quickly made a circle of close friends, both Lebanese and French, particularly the Lebanese poet and playwright Georges Schehade in addition to A.Tabet, G.Bounoure, J.Chevrier, H.Seyrig and G.Naccache. His studio was thought of by many as an art school and it became the favourite meeting place of artists such as Chafic Abboud, Elie Kanaan, Omar Onsi, Farid Aouad, Cesar Gemayel, Michel Basbous and others. “By 1928, journals like La Revue du Liban highlighted the importance of art by focusing on Lebanese painters and sculptors. Moreover, Lebanese artists were far from isolated from art movements abroad. Indeed, Corm and Srour trained abroad as did the next generation” wrote Professor Sarah Rogers, President Elect of the A.M.C.A., in the introduction to the artist’s retrospective exhibition at the Villa Audi, June 2007. 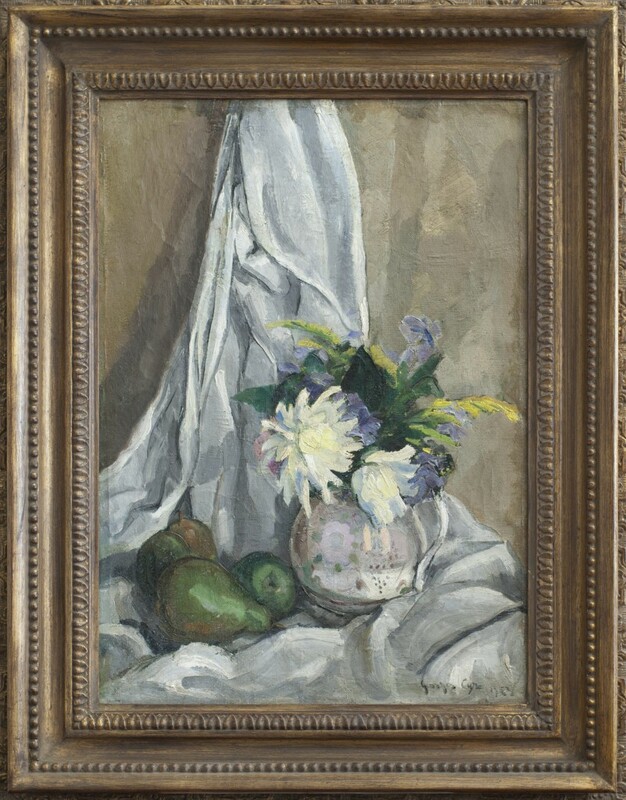 Cyr brought with him the influence of modernist movements in Paris and the Rouen School, (his own particular influences stemming from the work of Cezanne, Braque, Boudin and Vlaminck), as did many of his Lebanese contemporaries who had trained in Europe. In turn the influence of his network of artist friends in Beirut also left their mark on his work. Cyr worked also with mosaics, ceramics and stained glass. He taught painting and history of art, wrote numerous essays and lectured on the subject. As a result many see him as the true pioneer of modern art in Lebanon. Cyr held an important exhibition in the St. Georges Hotel in 1935. This was followed by another at the Stade du Chayla, Beirut (1953). In 1965, Brigitte Shehadeh organized a retrospective exhibition of the artist’s work at the Vendome Hotel in Beirut. Cyr was awarded the Lebanese National Order of the Cedar in March 1962 and in May of the same year became an officer of the Legion d’Honneur. Note 1: The term l’Ecole de Rouen, coined in 1902 by the French critic Arsene Alexandre, refers to a group of mainly French artists who worked in the city of Rouen, in Normandy, during the late-19th and early-twentieth centuries. These post-Impressionist artists, born between 1849 and 1898, followed in the footsteps of earlier great Impressionists, such as Claude Monet, Camille Pissaro, and Alfred Sisley. The members of the School of Rouen were drawn to the city as an escape from the strict academic attitudes found in the salons and galleries of Paris at the time. The artists of the School of Rouen prized artistic independence and individuality, often experimenting with movements such as Fauvism (in which artists prized painterly qualities and strong colours over representation), Divisionism (in which colour is broken down into its basic elements and presented on the canvas in tiny dots), and even Cubism (a practice in which the subject is depicted from a multitude of viewpoints, in order to represent the figure in a greater context). These free-thinking characteristics resulted in the Rouennaise artists’ separation from other French artistic groups. The term l’Ecole de Rouen arose as a means to differentiate these so-called rebels from the remainder of the art world that was centred in Paris at the time.